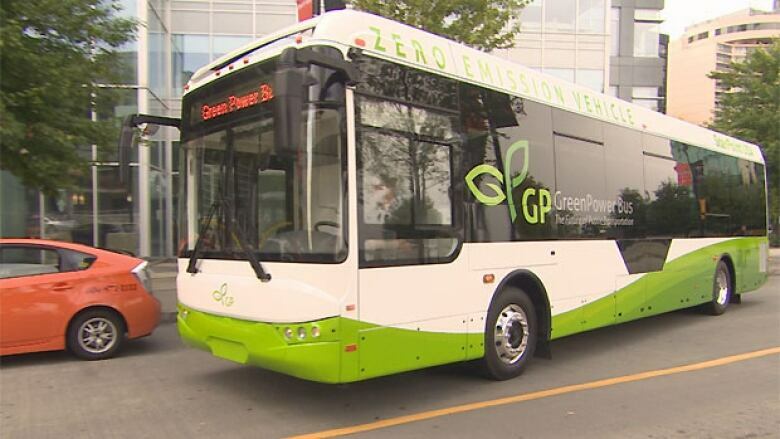 A Vancouver bus company hopes to sell its new zero-emission vehicle as the best way to reduce pollution in Metro Vancouver and elsewhere. A Vancouver bus company is touting its new vehicle as an effective way to cut pollution on the Lower Mainland. GreenPowerBus, founded in Gastown, rolled out its EV350 coach in downtown Vancouver this morning, calling it "a bus combined with a Tesla." The company says the zero-emission electric bus has no engine or transmission and can go 250 kilometres on a single charge. It uses what the company calls "FlexPower" to adjust to flat roads, hills and other routes. "The environment can no longer sustain big diesel-burning buses," said GreenPowerBus CEO Phillip Oldridge. "We can't afford to keep buying all of this type of diesel fuel. This is clean energy. It comes with a whole host of other benefits too. Noise reduction is one of them," adds Oldridge. Oldridge says the bus cost over $1 million Cdn. to build, but company chairman Fraser Atkinson insists the vehicle will pay off in the long term. "The fuel savings alone is $50,000 to $60,000 a year, over a 12-year economic life, which is the minimum stated life for a transit bus," he said as the new coach wound its way quietly through downtown Vancouver. "We're looking at savings that far eclipse the actual cost of our bus." Atkinson says with a 440-volt charging system, the bus can be fully charged in three to four hours. GreenPowerBus says it is showing its new vehicle off at various trade shows and is speaking with transit agencies. "We've been in to BC Transit," says Atkinson. "We are engaged with them in terms of talking about particular requirements that they have." GreenSpace hopes to have its buses operating on city streets within two years.